Firstly, heart felt condolences to all those who have lost family and friends to the disaster in Japan. 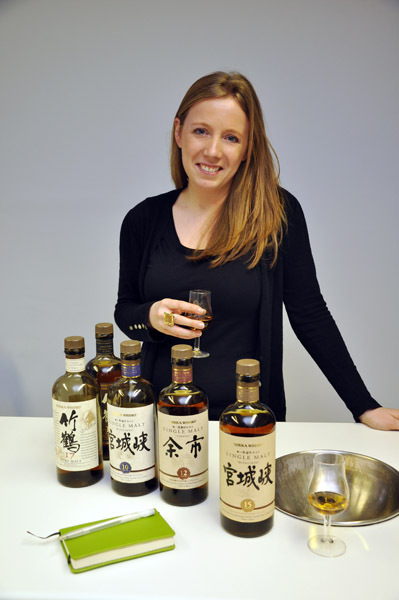 This week I have had a very enjoyable and enlightening afternoon getting to know the Nikka range of whiskies courtesy of the lovely people at Eau de Vie who represent Nikka’s interests. Having not really any knowledge of the brand before (the odd tasting at larger events, like the 1990 single cask at whisky live). I opted to run through the range in the recommended order which in hind site was a very good idea. 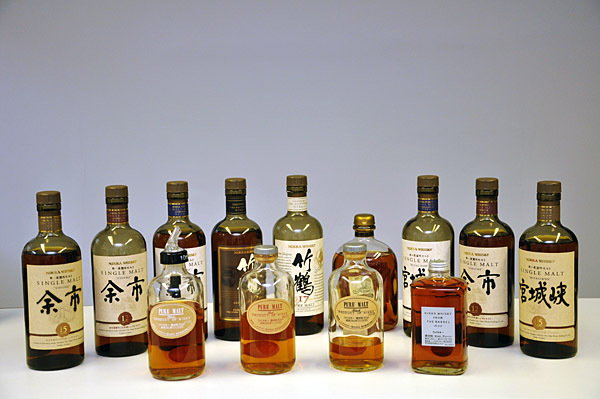 So I started with the Miyagikyo, moved onto the Yoichi and finished by trying their blends. I thought the Miyagikyo range was very good. A consistent style through the age statements but growing with complexity. They all display caramel and vanilla, but the difference in the 10 year old is the bourbon barrel maturation, the 12 and 15 being matured in sherry. The 12 and 15 year olds have more floral notes than the 10 and the 12 has a lovely spicy finish at the end. 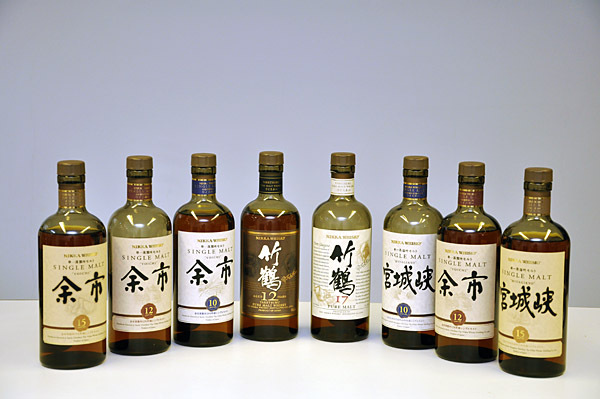 The Yoichi range on the other hand has more fruit than flora and more spice and wood. The 10 year old having hints of lavender as well. My over all favourite for flavour, texture, aroma and finish versus the cost was the 12 year old. It has a full mouth feel which becomes more oily with a touch of water, good complexity with flavours of vanilla and honey crossed with a menthol and smoky flavour developing in to burnt wood and toffee. it finishes with more burnt wood and peat. The 15 year old has more white fruits on the nose and more pepper and spice on the palate with a touch of praline. This chocolate becomes bitter chocolate on the finish with coffee and right on the end the flavour returns to white fruits, mainly pear. 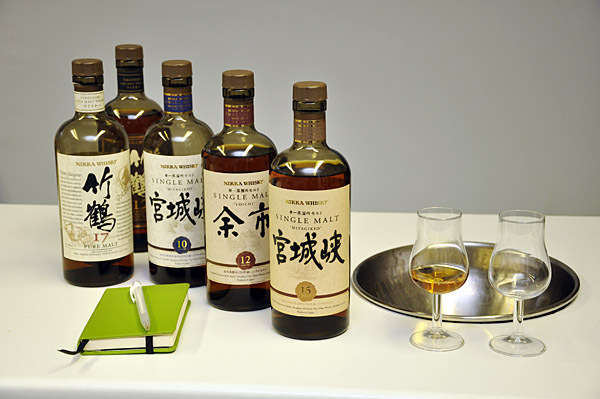 I next tried the Taketsuru 12 and 17 year olds. Both having flavours unsurprisingly of both the previous whiskies, but the two go well together. I thought the 17 year old was good, retailing at around £67, it is very rich with lots of preserved fruit and toffee, creamy texture with hints of hazelnut. it has a distinctive aftertaste of praline, more noticeable then the 15 year old Yoichi giving it a lovely balance against the spicy flavours of aniseed and citrus notes, leaving a freshness on the palate. Onto the pure malts. There are a white, red and black pure malt. The white coming from Yoichi, the red from Miyagikyo and the black being a blend of the two. The white is very peaty and salty, the red being sweet and fruity and the black being a little mixture of the two, to the extent that it tastes as if it is literally 50% of each. These are so vastly different that for me it would depend on my mood as to which I would prefer. Today it would be the red. Having never tasted Nikka before Whisky Live London 2011, I would imagine a bottle would grace my shelf at most points of the year. There are flavours to suit most seasons. The bottle I have at the moment is a single cask Miyagikyo 1990 which Olivia at Eau de Vie gave me to taste at whisky live, and after a little hunting I found a bottle from a small shop in York. Getting very rare now, (only 349 bottles were produced), it is fabulous stuff and was retailing around the £120 mark, so although not an every day drinker, it certainly deserves a place on any shelf for those who fancy something with a greater complexity, texture and finish now and again. This entry was posted on March 26, 2011 by Champdenwhite. It was filed under General Tastings .